Seasonal Migration and Distressed Migration of rural people to urban areas has been a common phenomenon of past many decades, the former not being uncommon when compared globally but the later one is acquiring alarming proportions. Due to influx in urban areas, cities are becoming overcrowded as more and more people are chasing limited resources be it land, water, electricity, public transport etc. Limited land leads to formation of untidy clusters like slums and chawl in metro cities. Increased population leads to increased vehicle traffic causing more pollution, long term effects of which are more severe in landlocked cities like Delhi. Similarly pressure on water and increased electricity demand leads to water contamination, pollution(air + water), disease outburst, unhealthy food etc. Due to this rural areas remains devoid of any talent and initiative as the cream crowd is leaving it. They still remain sort of cut off from urban India when it comes to development. 1. Lack of sufficient earning opportunities. 3. 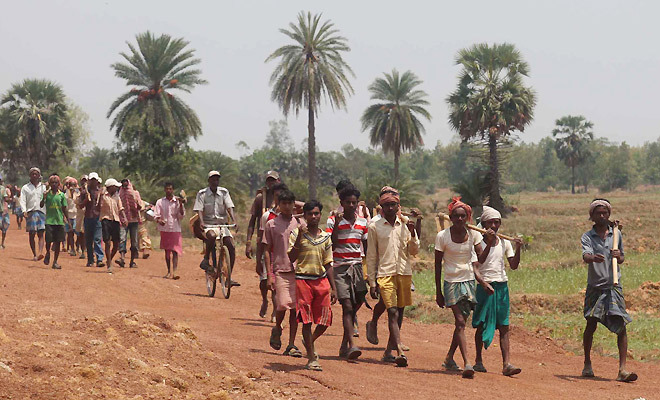 Bonded Labour still prevalent at many places. 1. Aspiring to live a dignified life without fear. 2. To strive for a better future of their children. 1. There are almost non existent employment opportunities for educated youth in rural India so they are bound to move to cities to utilise their talent and recover their education cost as mostly in rural areas employment is limited to the field of agriculture. 2. Landless workers in rural areas are still exploited by landlords and are frequently underpaid for their work. Even in MNREGA many a times there have been reports of financial impropriety. So a landless poor finds it more attractive to move to urban areas where can he can fetch up to Rs. 300 per day for unskilled work. 3. Due to erratic monsoons, insufficient irrigation facilities, low productivity, non existent transport facility, tardy implementation of Minimum Support Price(MSP) and exploitative traits of APMC Agricultural Produce Market Committees even a land owning farmer finds agriculture as a non lucrative option and migrates to urban areas for a petty job as their is no risk involved in this job. 1. The best remedy to solve any problem is to solve it at its very root. There is a need to create sufficient opportunities at the rural level. 2. Caste discrimination should be minimized by stricter law enforcement so that all people can get the impression of living in an egalitarian society. 3. Bonded Labour should be completely removed. 4. The JAM trinity(Jan Dhan + Aadhar + Mobile) would be very effective so that the payment of MNREGA and other subsidies can be directly transmitted to beneficiary's account. The implementation of JAM trinity should be followed up regularly and rapidly. 5. Government should encourage Multi National Companies(MNC's), Call centers etc. to open up their offices in the vicinities of the village so that educated youth there can get employment opportunities. 6. The village farmers should be educated about social forestry, rainwater harvesting and other agricultural ways of increasing the productivity of their land. 7. The local population should be protected against the whims and fancies of the local authorities by empowering them through education and efficient dispute resolution mechanism.